What are the possible drawbacks? You know when you want to tell someone that something isn’t difficult you say “it ain’t brain surgery”. This is apparently difficult. Fortunately, the surgeon I have is skilled. Still, he was clear in making sure we understood that there are risks – some of which are very bad indeed. But the most likely outcome at this point is that I’ll lose some motion and sensory capacity in my right leg. The tumor is right on the part of the motor/sensory strip that controls that. So, I’ll probably have physical therapy to go through, could require some form of assistance (e.g. cane, boot, brace) to help me walk, and am likely to lose some amount of sensation in the leg. Am I going to be on chemo/radiation? What is my life expectancy? What type of tumor is this? These and bunches of other questions are really not knowable at this point. Once they get the tumor out, they’ll be able to do pathology on it to better understand what’s going on, how truly active it is, and what the appropriate long term treatment and prognosis is. He still feels comfortable predicting that it’s a low-grade glioma, but more details about the severity of it beyond that still remain to be seen. So, stay tuned. How long am I going to be in the hospital and how long am I out of work? At least 2 days in the hospital, but the actual length depends on how I do in recovery. I’m likely going to be out of work for 4-6 weeks, but that too is only a rough estimate at this point. I fully expect to put a serious dent in my Netflix queue, but I know I’ll be itching to get back as soon as possible. Will I be awake for the surgery? No. He’s participated in procedures where this was the case, but he says they have better methods for this now. I’m experiencing occasional instances of my right leg going numb for 15-90 seconds. Maybe two days per week, 1-2 times per day. Are those seizures? Probably – though apparently only mild ones. Good to know. I feel amazingly fortunate for all the love and support you all have sent my way. It’s hard to think you’d count yourself lucky after learning that you have a brain tumor, but I have been truly blessed the last two weeks. None of us knows ahead of time the path our lives will travel, the ways in which God will call on us to bear witness and support us when the struggle grows difficult. But I most certainly am gaining an appreciation for that now. That support has come through all of you. Even if you weren’t aware of it, those of you who have been sympathetic, sent a card, or offered me a ride to/from work have been the hands and feet of God. Thank you all. 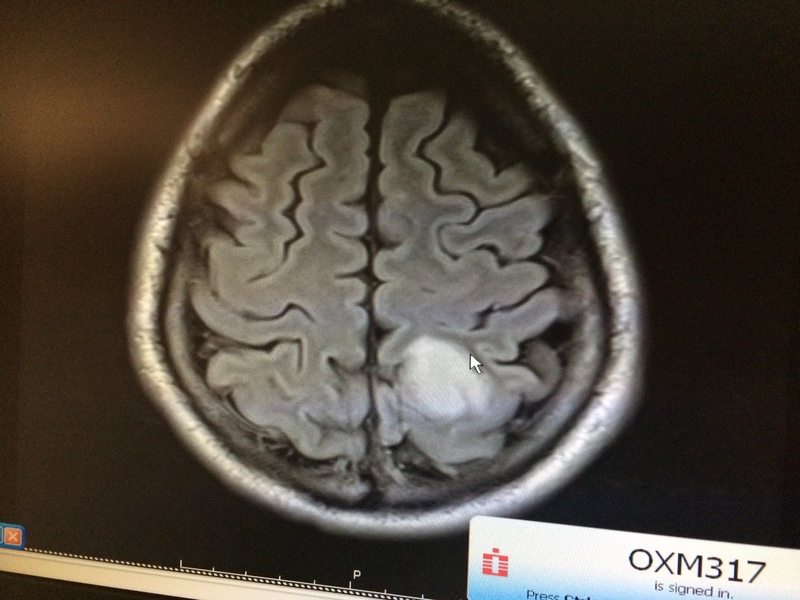 I have a brain tumor – now what? Several folks have asked for an update on my health. Some of this will be repetitive to some of you, but I wanted to document the whole story anyway. Last Saturday evening, Matthew was in New York on a high school band trip. Julie and Cassady had just left the day before on a confirmation trip and were in Atlanta on their way to St. Simons Island. I was working at home with a friend (Ben Reed) on two iMovie projects (1, 2) when all of a sudden my right leg started to feel some strange combination of numb and clumsy. I knew pretty much right away that this wasn’t a case of my foot being asleep so I had my friend take me to a local trauma center. At the trauma center, they gave me a CAT scan and an Xray. The CAT scan showed something that might have either been a stroke or a tumor so I was transferred in an ambulance (full speed, lights and sirens on) to Riverside Hospital about 10 miles away. They took me into an exam room there and I quickly saw my right leg starting to convulse. Within 30 seconds, I was having a full-on seizure that apparently lasted for 4 minutes. I only remember a bit of it but it was terrible – the most frightening thing you can imagine. While I was under, they apparently did another CAT scan and confirmed that it didn’t appear to be bleeding (i.e. what you could see wasn’t growing) and thus not a stroke. I awoke awhile later in a room in the brain and stroke center of the hospital. After awhile, they wheeled me down for a MRI which has much higher image fidelity, though you have to lay very still in it and it’s extremely confined. That lasted an hour and I was really glad when it was over. Not moving for an hour is hard. What the neuro-surgeon told me was that he’s 99% sure that what we see on the MRI is a low-grade tumor on the parietal lobe of the left side of my brain (you are looking up through my chin in that photo). Some of you know that my mom died of a much more aggressive brain tumor about 11 years ago. This appears to be more like a stage 1 or probably stage 2 glioma than a stage 4 (the latter of which has a life expectancy of 6-11 months). The neuro-surgeon said that people with a stage 1 can live 20-30 years still – some with little or no treatment. My own reading and research (pro tip – googling around for glioma is a depressing undertaking) indicates that he was probably being hopeful and optimistic at a time when I needed it, but who knows. There are a few good things in the MRI report including the fact that they described the tumor as “sharply circumscribed” (i.e. it has well defined edges) and its only 2.6cm in the largest dimension. Julie said she saw online that 6cm is a point where the concern level goes up dramatically. Also, the fact that the tumor hasn’t crossed the midline of the brain is good. Given that even a biopsy in this case involves drilling a hole in my skull, it seems pointless to do that and not just remove the tumor – especially with the risk that the biopsy needle could transport bad cells into a new region. But we’re still doing research. We are meeting with the neuro-surgeon again on April 7 and have a whole host of questions, including what are pessimistic, realistic, and optimistic outlooks for people like me, how long does he think I’ll be out of work, how does he know what to remove, and when would we do this etc. Cassady’s confirmation is Sunday April 27, so I’m hoping that the procedure itself can be delayed until after that. But we’ll let the doctor be our guide. Right now, I feel mostly normal. My right leg, which was still clumsy in the days after my hospital stay, is occasionally awkward. But physically, I don’t feel much different than I did a week ago prior to running nine miles on Saturday morning (I had been training for the Cap City Half Marathon as part of a Run For God program at our church). In the next couple of weeks, we’ll be reaching out for help in a couple areas. In particular, because I’m not able to drive, getting to/from work is going to be a challenge. I have already been the subject of more love and affection than anyone deserves. I’m very thankful to my buddy Ben who took me to the hospital and stayed long into the night, my sister-in-law Jill who works at the nearby James Cancer Hospital and spent the night and morning with me, my beautiful bride Julie who hopped off the confirmation trip and flew home to be with me, and my sister who flew in from California to spend the week with us. And of course the folks at work, the folks at church, the people in Scouts, and several friends on twitter and facebook have all been so very loving and supportive. Please know that I treasure and value you all very much. You all mean the world to me. 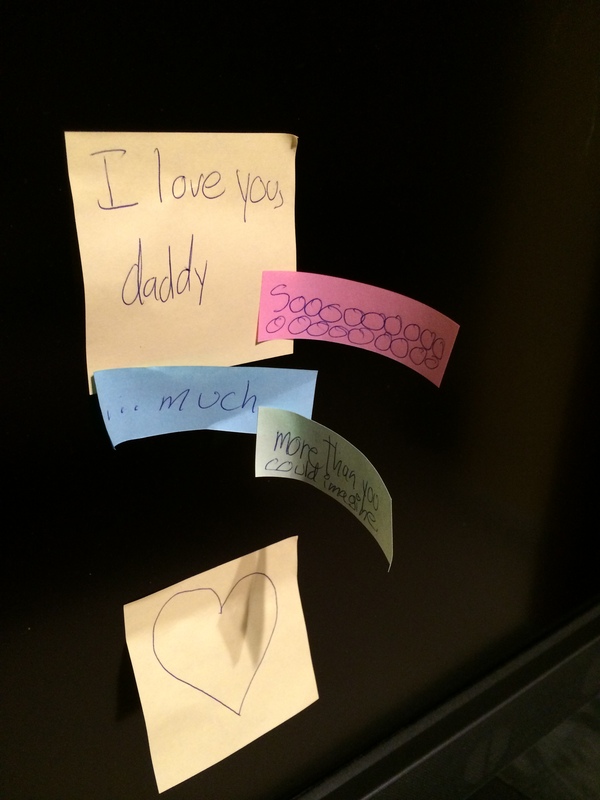 When I went up to bed last night, I found post-it notes all over our room from our daughter. It was really emblematic of what all of you have been doing for me and us. Know that it is appreciated. Right now, I have to admit that I feel fortunate. Having a brain tumor is not something I’d wish on anyone, but the entire experience has helped me gain a mountain of perspective and realize just how much each of us is loved. My one piece of advice to each of you is to try and appreciate that today. I’m now seeing demonstrations of it well beyond what I deserve. The love I’m feeling – from friends, from family, from God – is overwhelming. And it’s available to us all. Thank you all for everything you do. 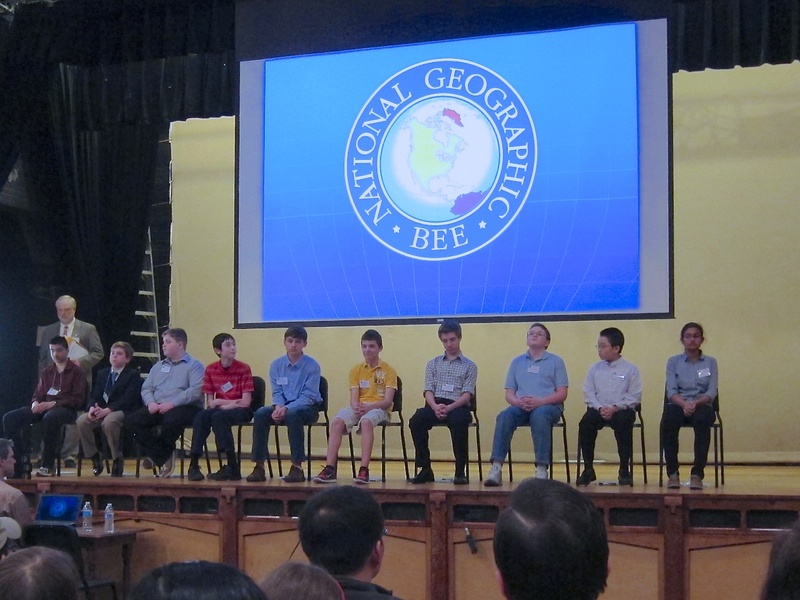 Geography Bee – or Are You Smarter Than an Eighth Grader? 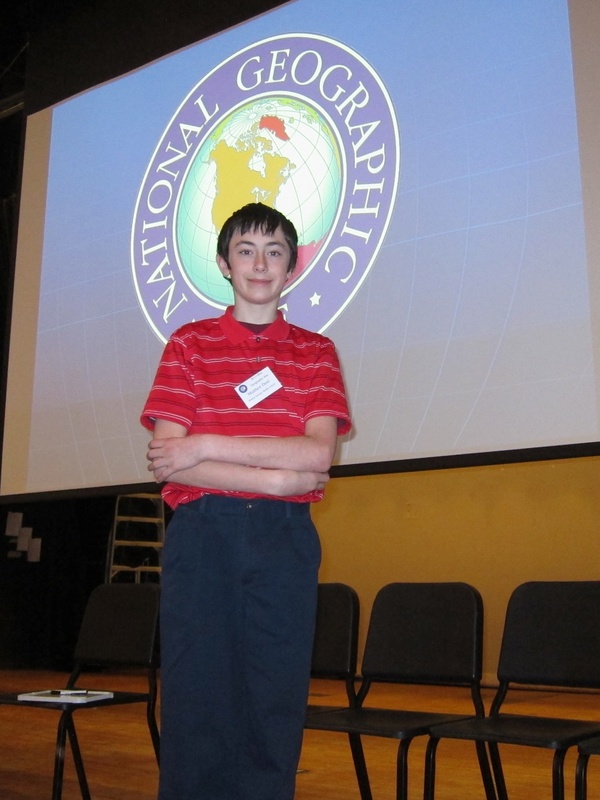 Today was the National Geographic State Geography Bee, and for the third year in a row, Matthew got to go. Even getting to the state bee itself is quite an accomplishment as it means you’ve won the competition at your middle school, then taken the test that all school winners take, and are selected as one of the top 100 kids in the state. Matthew has always been a huge fan of geography, and it’s been extremely gratifying to see him have success in this. The first part of the state competition is the preliminaries where each contestant is asked 8 questions. The top 10 kids move on to the finals with a tie-breaker round used if necessary to get to the 10. This year, Matthew was one of 12 kids who got all eight of their preliminary round questions correct, so he went into the tie-breaker round. Although this was the second year in a row where it had happened, my understanding is that it’s more common that the tie breaker round consists of kids who got 7 of 8, with fewer than 10 kids typically getting all 8 right. Matthew survived the tie-breaker round, getting both questions correct and moved on to the finals just as he had last year. Once there, his goal was just to improve on his position of last year (tied for fifth), and he did just that – this year tying for fourth in the state. Needless to say, we’re very proud of him. The final round moved fast enough that I wasn’t able to get down all of Matthew’s questions, but I did manage to write down the ones he faced in the preliminaries and tie breaker round. 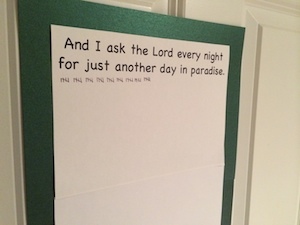 So, how many would you have gotten right? 1. Death Valley is located on border between California and which other state – Nevada or Illinois? 2. Which city is more populous – Indianapolis or Chicago? 3. Which country experiences colder winters – Cambodia or Mongolia. 4. Which island country is not in the Pacific – Samoa, Vanuatu, or Mauritius? 5. In October 2012, archeologists announced the discovery of Viking artifacts such as yarn and wet stones on Baffin Island in what North American country? 6. The syncretic religion of Santeria, also known as Regla de Ocha developed in this, the largest of the countries in the Greater Antilles. Name it. 7. From the 16th to the 18th century, Poland was united with what present day country whose capital city is Vilnius? 8. This capital city is the legislative capital and seat of parliament for South Africa and is overlooks the Table Bay. Name it. 1. The Seikan Tunnel connects Hokkaido and Honshu in what island country? As a parent, you quickly learn that your kids are going to surprise you more often than you think. You just hope that there are more positive surprises than negative ones. We had a positive one recently that I thought I’d share. Over the last couple of years, our son and daughter have become fans of several podcasts. In particular, they really love The Incomparable and on the 5by5 podcast network and the MacWorld podcast – especially the Pundit Showdown episodes which they find hilarious. I can’t tell you how many times they’ve listened to the Star Wars episodes of the former, but they practically have them memorized. About a week ago, my wife and I went out to dinner. When we got home, the kids told us they had recorded their own podcast episode. It’s in the style of The Incomparable where they completely dissect The Princess Bride. Nobody but their parents will likely listen to the whole thing, but it just tickled me to see how they imitated something they love. Listen to The Princess Bride episode on an unnamed podcast. You asked for my hands, that you might use them for your purpose. I gave them for a moment, but withdrew them, for the work was hard. You asked for my mouth to speak against injustice. I gave you a whisper that I might not be accused. You asked for my eyes to see the pain of poverty. I closed them, for I did not want to see. You asked for my life, that you might work through me. I gave a small part that I might not get too involved. and only with those who make it easy to do so. That I might take seriously the meaning of your cross. 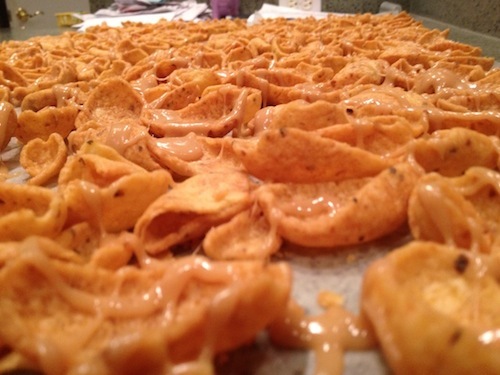 My lovely wife Julie discovered this recipe a few years ago and it’s been a family (and friend) favorite ever since. Based just on the title, it’s hard to believe that these could taste as good as they do. But taste good they most certainly do. And they’re very easy to make. 2. Combine corn syrup and sugar in a pan and bring to a boil. We frequently double the above recipe if we’re sharing beyond the family, but the above would serve 8-10 people.